Ishikawa prefecture（石川）is located along the Japan Sea, on Toyama's（富山）left in the Chubu region（中部）. It is famous for Kanazawa（金沢）, which is like a small Kyoto, though it has something that Kyoto doesn't have-- Kenrokuen（兼六園）, 1 of the top 3 landscape gardens in Japan (in fact the best out of the 3 in my opinion). The first time I went to Kanazawa/Kenrokuen was with a tour group in 2008, impression of the place was vague. Though when I went there again during a solo trip in June 2013 (together with Toyama's Tateyama Kurobe Alpine Route), fell in love with the place! Perhaps partially due to the fact that it wasn't as crowded as Kyoto, yet. Traveling around Kanazawa can be done via the city loop bus, and a 1 day pass costs 500 yen. The 1st key area is the Higashi Chaya District（東茶屋街）. Chaya District is the area with teahouses/restaurants where Geisha perform in, just like Gion（祇園）in Kyoto. There are 3 Chaya Districts in Kanazawa, and Kanazawa City Tourism Association holds a geisha performance show in all 3 Chaya Districts every Saturday. It is quite near Kazuemachi Chaya District（主計町茶屋街）which I didn't visit. Nishi Chaya District（西茶屋街）is in the 2nd key area. It is smaller compared to Higashi Chaya District and doesn't have much activity. Though it is near Myoryuji（妙立寺）, also known as Ninja temple（忍者寺）, which is a very interesting attraction. Costs 800 yen for entry, comes with 40 minutes guided tour. Reservation in advance is required. Actually, this temple that dates back to the Edo period has nothing to do with Ninja, however its structure is complicated with lots of tricks, thus given this name. For example, it appears to be a 2 storey building from outside, but actually has 4 storeys and 7 layers. There are no revolving doors, but there are doors that lead to different places when slided in different direction, resulting in hidden rooms! There are MANY temples in this area! 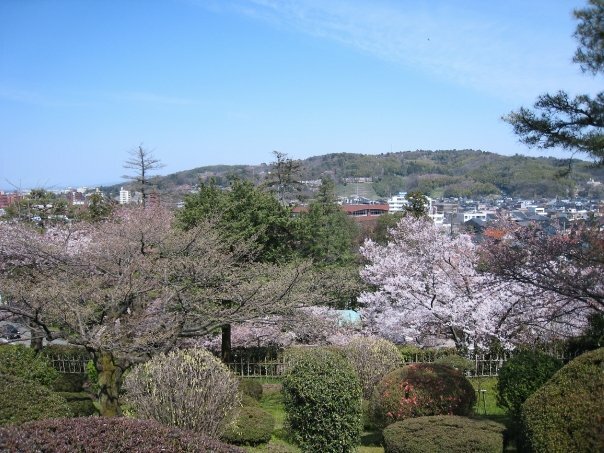 The 3rd key area is where the icon of Kanazawa-- Kenrokuen is. "Kenrokuen" means "Garden of the six sublimities", which refers to spaciousness, seclusion, abundant water, artificiality, antiquity and broad views, the six attributes for a perfect garden. Indeed, it is really spacious, and the design/combination of greenery and waters is simply perfect! It is also on higher grounds, so it kind of feels separated from the bustling city. Kanazawa Castle（金沢城）is just beside Kenrokuen. Though it is slowly being rebuilt, so the structures look very new. I didn't spend too much time there. The Kenrokuen/Kanazawa Castle area also has many museums which I didn't go to, such as Prefectural Museum of Art, Prefectural History Museum, 21st Century Museum, Honda Museum, Craft Museum, Noh Museum etc. To the left of this area is Nagamachi（長町）Samurai District. I love castle towns, and this one didn't disappoint! The canal flowing through adds to the tranquility. The Shinise Kinenkan Museum （老舗記念館）was a pharmacy, now a local crafts museum. Also visited Nomura-ke（野村家）, a restored samurai house. It was nice appreciating the garden while sitting on the tatami on the second floor. Kaga Hanshi（旧加賀藩士高田家跡）was previously a stable for horses. Admission is free for this attraction. Another free attraction is Ashigaru Shiryokan（足軽資料館）. Ashigaru were footsoldiers that were of the lowest rank in the samurai class. There are 2 reconstructed houses here, showcasing their simple lifestyle. There are a few other paid attractions which I skipped. Oyama Shrine（尾山神社）a significant shrine just nearby, is dedicated to the first lord of local Maeda Clan-- Maeda Toshiie. The interesting thing about it is that the architecture is a combination of Dutch, Japanese and Chinese influence. As for food, the fresh seafood market Omicho（近江町）is a famous spot, though prices can be quite steep. When I was in Kanazawa, also had a small adventure-- follow the beautiful setting sun! Asked the staff at tourist information center near Kanazawa station where best to view sunset, and she recommended a place called Uchinada（内灘）that was 17-minute train ride away. After reaching the station, had to walk to the beach (looks like walkable distance from the map), though I had no idea how far it was exactly. Simply followed the direction of the sun, passing through endless rows of residential houses on the way. I was alone and down with flu, weather was a little chilly, my legs were really tired from a day's sightseeing, the surroundings were very unfamiliar, and I had no idea whether the destination was worth it or not, but still, I kept pushing ahead. After around half an hour (seemed like eternity to me though), finally reached the place! Vast sand and waters and magnificent sunset, guess the trip was worth it!